The M-Pesa shops that were robbed at Njuguini estate in Athi River on Monday, January 14, 2019. A man was shot dead by armed gangsters and another hospitalised after they attempted to stop the fleeing criminals in Athi River on Monday. 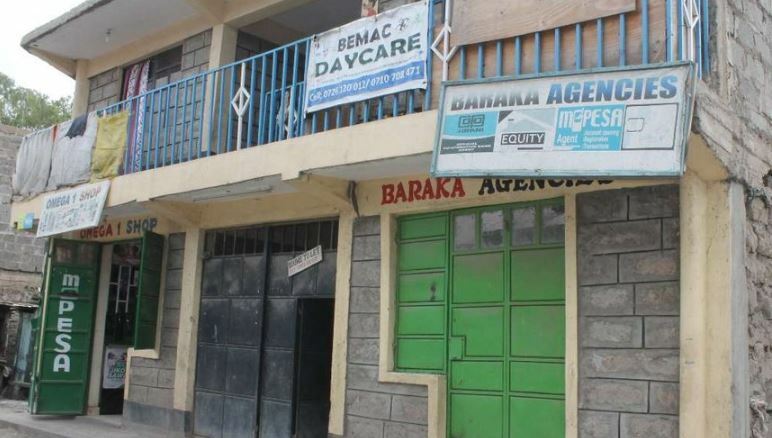 The victims were among residents who attempted to catch the robbers as they escaped on motorbikes after stealing from two M-Pesa shops at Njuguini estate. Confirming the 5.40pm incident, Athi River police boss Sharma Wario on Tuesday said the deceased died on the spot while the other was seriously injured. In one shop, the gangsters stole cash(Sh77000), seven mobile phones that were on display, and airtime cards worth Sh86,000. “The thugs, who were brandishing guns, entered the first M-Pesa shop and demanded cash. The attendant [a woman] gave them Sh77,000,” Wario told the Star. In the second M-Pesa shop, the thugs stole a mobile phone only. Wario said the gang escaped on two motorcycles after opening fire and shooting two innocent civilians. “The shop attendants raised the alarm. Members of the public confronted the gangsters. They did not know that they were armed. The thugs shot two people, one died at the scene,” Wario said. He said police have crucial leads and appealed to the public to give information that will lead to the arrest of the gang. The survivor is recovering at Shalom Community Hospital.